The below-zero temperatures were inhospitable outside the Columbian Meeting and Conference Center in West Bend, Wis. on January 5, the feast of the Epiphany. However, the event inside was warm and lively. 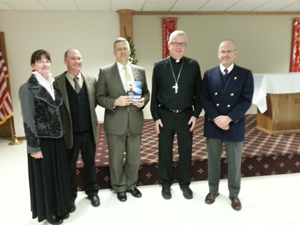 Over 110 people attended the double-book signing program titled “Return to Family: Getting Your Family Fired Up About Honor, Role Models and the Faith.” The afternoon of reflection about America’s future was sponsored by the local Knights of Columbus and chapters of the Men of Christ and the Women of Christ. (far left), John Horvat, and Norman Fulkerson. The event was honored by the presence of Most Reverend Donald J. Hying, auxiliary bishop of Milwaukee. The two speakers were John Horvat, II, vice president of the American Society for the Defense of Tradition, Family and Property (TFP) and author of Return to Order: From a Frenzied Economy to an Organic Christian Society and American TFP member Norman Fulkerson, award-winning author of An American Knight: The Life of Colonel John W. Ripley, USMC. Both shared their solutions for a better America and launched their recently published books. The program began with a sung Mass celebrated by Bishop Hying with the uniformed Knights serving as a guard of honor. It was followed by lunch catered by the Columbian Center. Mr. Horvat presented “Honor Thy Father and Thy Mother: The Key to Bringing America Back to Order,” which focuses on what it means to honor parents, why the family needs to be fired up with the idea of honor and how a sense of honor can revitalize all society. 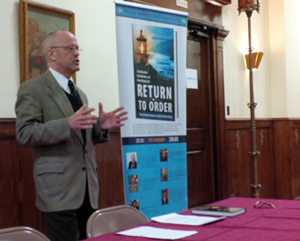 Norman Fulkerson addresses the audience at St. John Cantius parish in Chicago. As a complement to Mr. Horvat’s presentation, Mr. Fulkerson spoke about “How Role Models Can Inspire the Family: The case of Col. John Ripley USMC.” He demonstrated how role models can change family dynamics, invigorate parents and inspire the hearts of teenagers. He cited Col. Ripley’s achievements as an inspiration for a hero-starved society. Both authors signed copies of their books, answered questions and conversed with those present. The welcoming atmosphere and hospitality made the event special and seemed to reflect the desire of many Americans who want to return to order. The day before, the two authors gave the same presentations at a smaller event at St. John Cantius’ Parish in snow-covered Chicago. 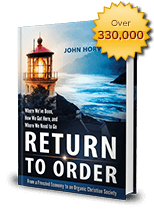 This entry was posted in Featured and tagged America, brutal pace of life, Catholic Church, Christian civilization, Christian principles, consumer society, false happiness, Family, frenetic intemperance, organic Christian society, Return to Order by John Ritchie. Bookmark the permalink.